Krav Maga San Francisco, offering self defense, TRX training and fitness classes in the San Francsico area, is working with “A Home Away from Homelessness” to teach homeless and formerly homeless children self-defense. Krav Maga is working with "A Home Away from Homeless"
Krav Maga San Francisco, a local fitness venue to get fit, have fun and learn self defense, is always searching for ways to give back to the local community. 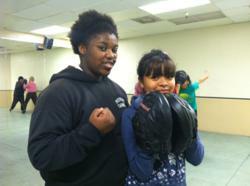 Most recently, Krav Maga San Francisco has been providing an eight-week program that teaches homeless and formerly homeless middle school children from “A Home Away from Homelessness” self-defense techniques. In the process, the program will help them get fit and build their confidence. “I am surprised at the amount of stress I was holding in,” one of the children, Cindy, said. Gail Foland, owner of Krav Maga San Francisco, is a fourth-generation native of San Francisco and together with her husband, and Krav Maga trainer, Barny, the training facility makes it a point to provide free self-defense for non-profits throughout the community. “We have partnered with ‘A Home Away from Homelessness,’ a local non-profit organization, as part of our dedication to give back to the community,” Gail Foland, owner of Krav Maga San Francisco, said. “A Home Away from Homelessness” gives children the opportunity to experience having safe and supportive spaces that respect and foster their strengths and abilities. The organization aims to build confidence, skills and community through educational, social and recreational activities. It will be hosting its 18th Anniversary Gala on May 4 at the War Memorial Green Room. For more information about “Home Away from Homelessness,” or to make a donation or volunteer, visit http://www.homeaway.org. For more information about any of Krav Maga San Francisco’s services, call 415-658-9226, view the fitness venue on the web at http://www.kravmaga-sf.com or visit 1455 Bush St. in San Francisco. Krav Maga San Francisco (KMSF) is the only affiliate of Krav Maga Worldwide (KMW) in the Bay Area. Krav Maga Worldwide is the largest reality-based, self-defense organization in the world with more than 240 licensed schools, more than 500 law enforcement and government agencies and multiple specialized military units trained. KMSF’s exclusive membership provides one week of free access to all KMW affiliates and training centers, including those in North America, Asia and Europe. This affiliation ensures all Krav Maga instructors are certified and have passed the rigorous standards of KMW instructor certification. Members will benefit from the best instructors in the Bay Area, guaranteeing the quality and consistency that is deserved. Krav Maga San Francisco is a two-floor, 12,000-square-foot training facility, offering more than 60 classes, seven days per week. They also offer CrossFit, TRX training, self-defense training, Conditioning, KO Bag and fitness classes. Membership allows access to unlimited classes, seven days per week, including the weight room and bag room. Contact Krav Maga San Francisco for a free, three-day pass. Krav Maga provides a eight-week program that teaches homeless and and forerly homeless children self-defense techniques.